This recipe came as a surprise. It is not my recipe nor a recipe that I obtained from books or internet. It is a recipe that my Facebook friend from Athens had given me via private message in the mid night. She said that she loves these snacks very much and none of her friends have ever rejected her offer of this delicious snack. Her reason of giving me the recipe is very simple. 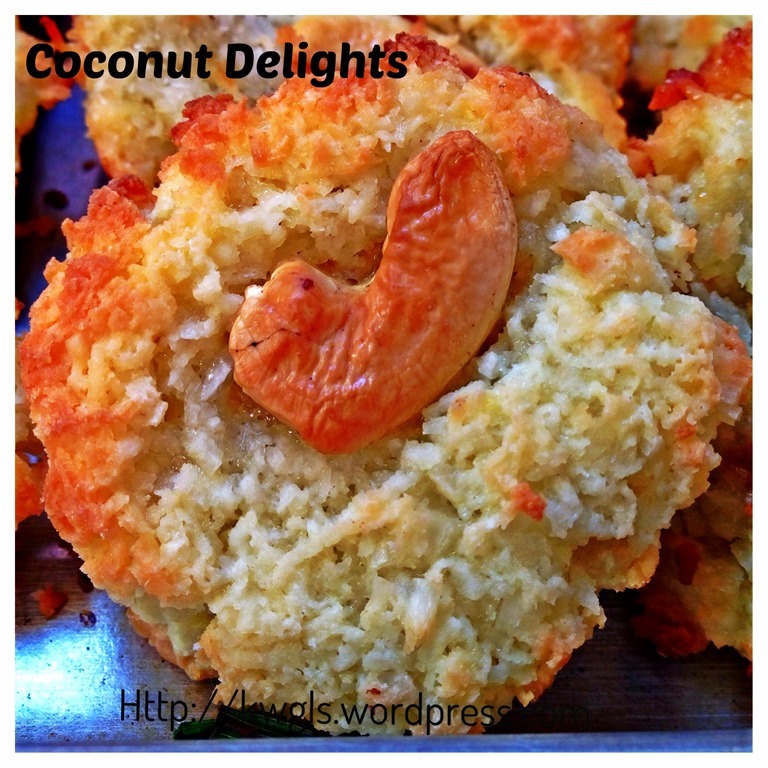 She wanted me to try and share with more people and I have to thank her for her self less sharing of her recipe. On the next morning, I read the ingredients and I knew immediately that it will be a very nice snack. 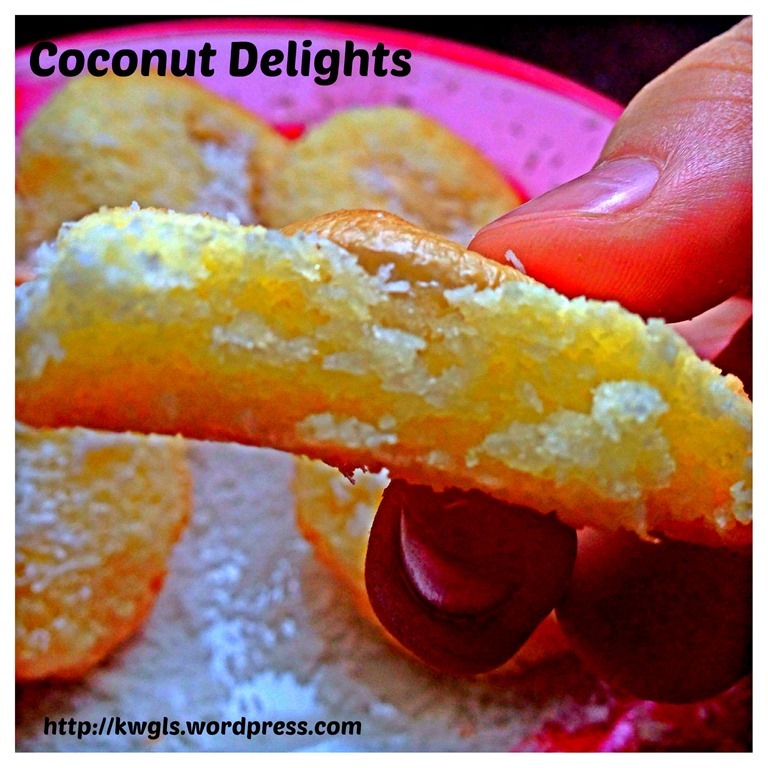 There are only 3 ingredients in the recipe – sugar, desiccated coconuts and eggs. Any combinations of these 3 ingredients will definitely be superb. 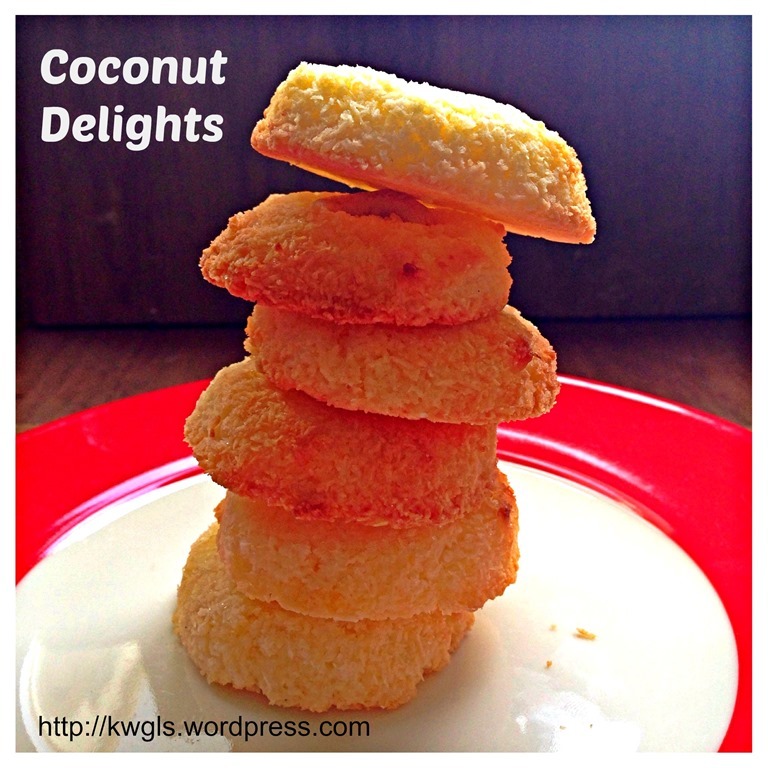 It is just like Kaya (coconut jam) or traditional coconut tarts. Putting these 3 ingredients in another shape will not alter the taste. 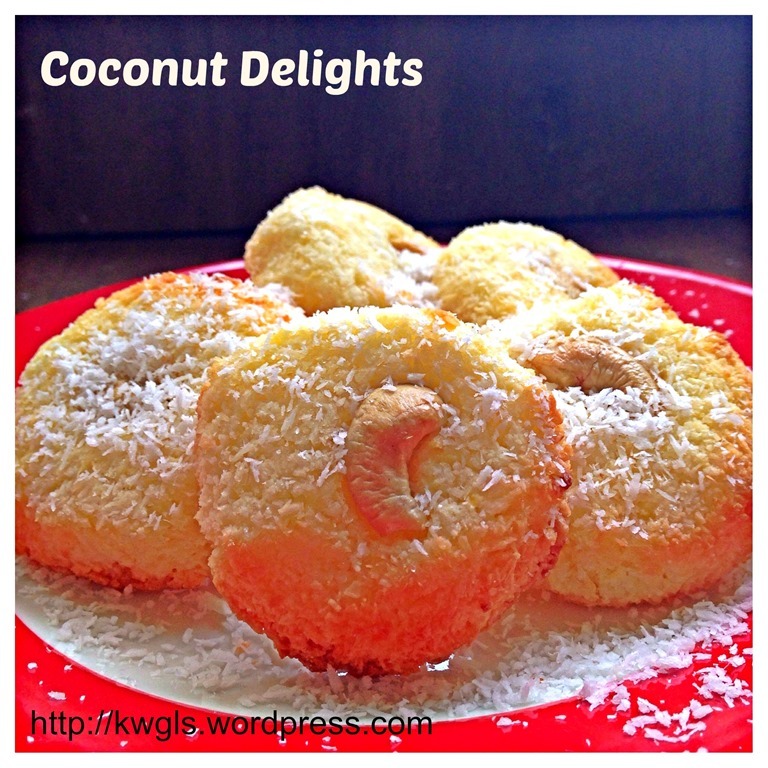 I have decided to try the recipe and on the next day, I happily rushed to the market to get hold of some freshly grated coconuts. I went home and tried the recipe. 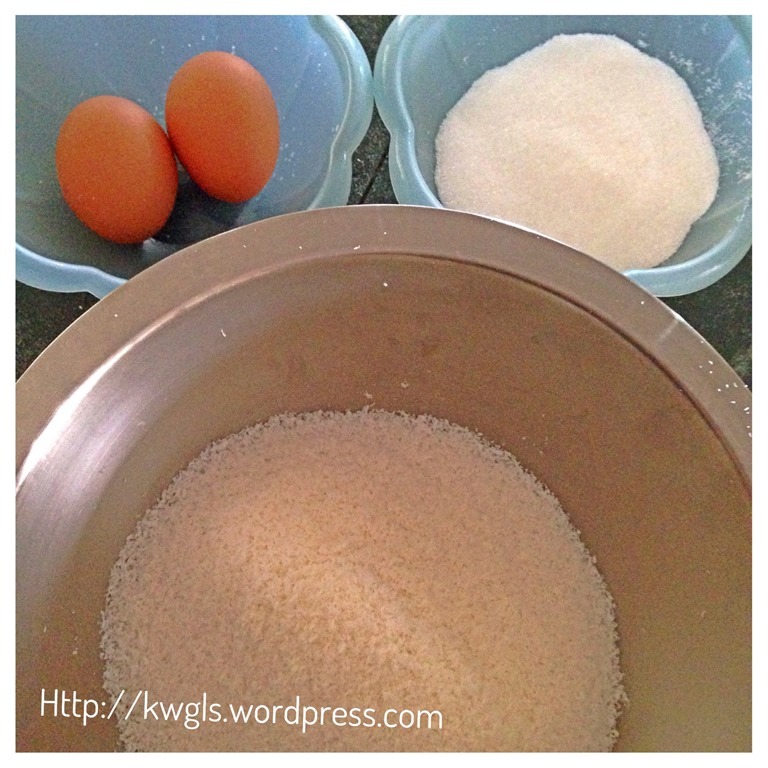 I found that something is funny, it is shapeless as the batter was very watery. 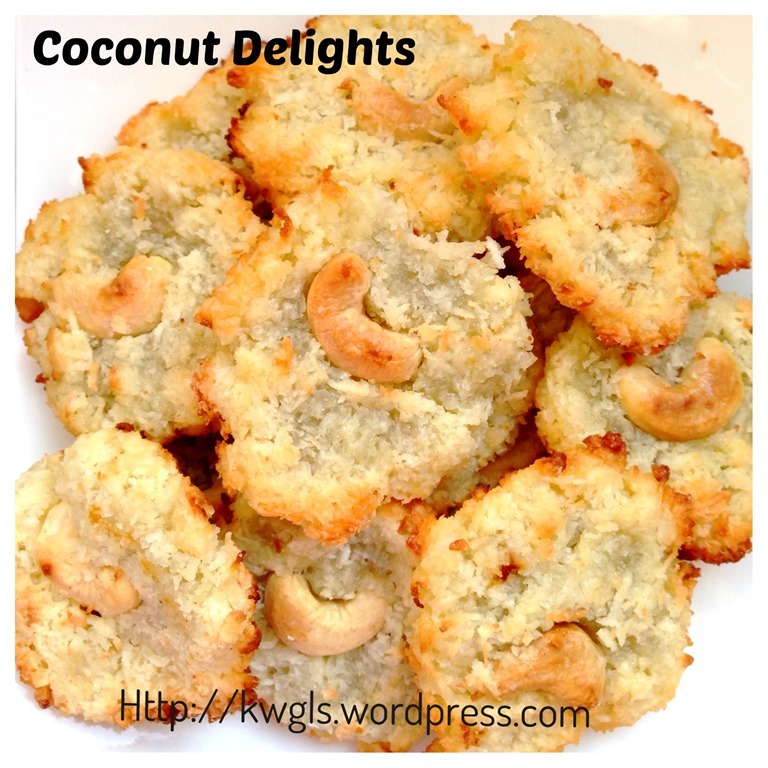 I private message her and told her the scenario and she “screamed” – Did you read the recipe, it is desiccated coconut and not fresh coconut…… It was a blunder that I made…. Ha-ha. Well, the end product was also very nice. Lightly greased a baking tray. 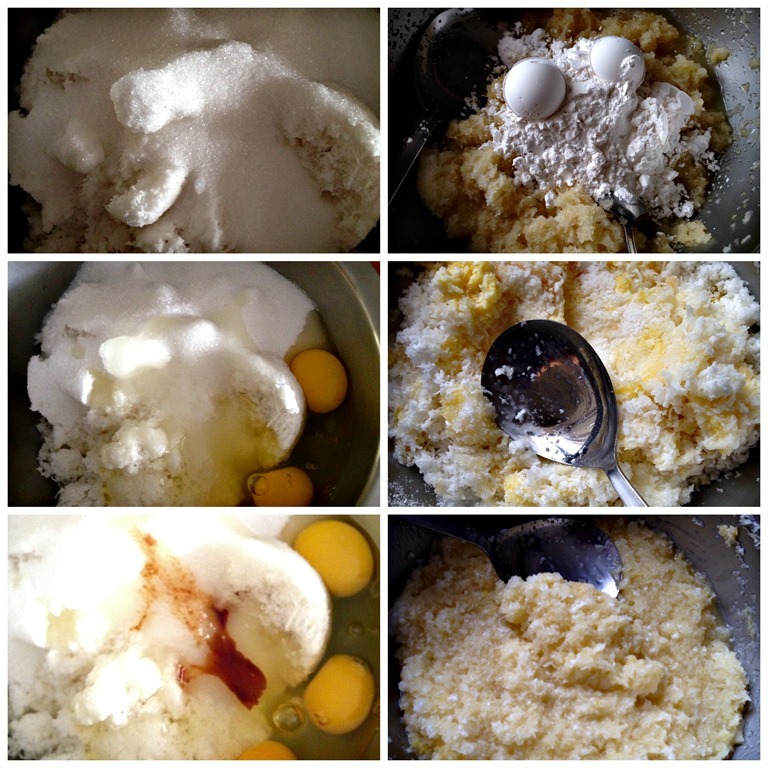 Mix all ingredients (fresh shredded coconut, eggs, sugar, vanilla essence/lemon zest and corn starch) together. Stir until well mixed. Take a spoonful of batter and put it in the baking sheet.Place on baking tray with about 1 finger apart. 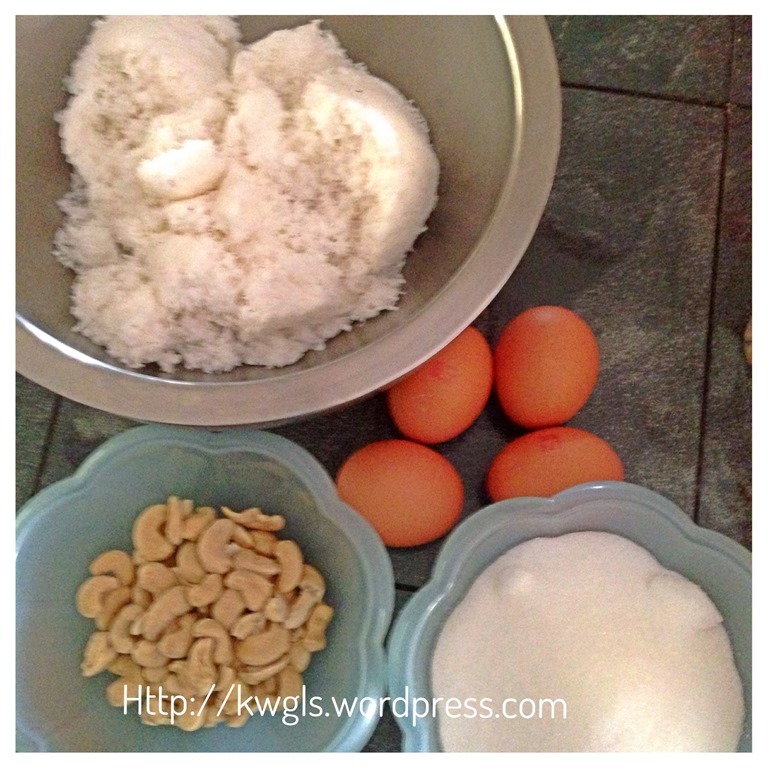 lightly press it and put on top your desired nuts. 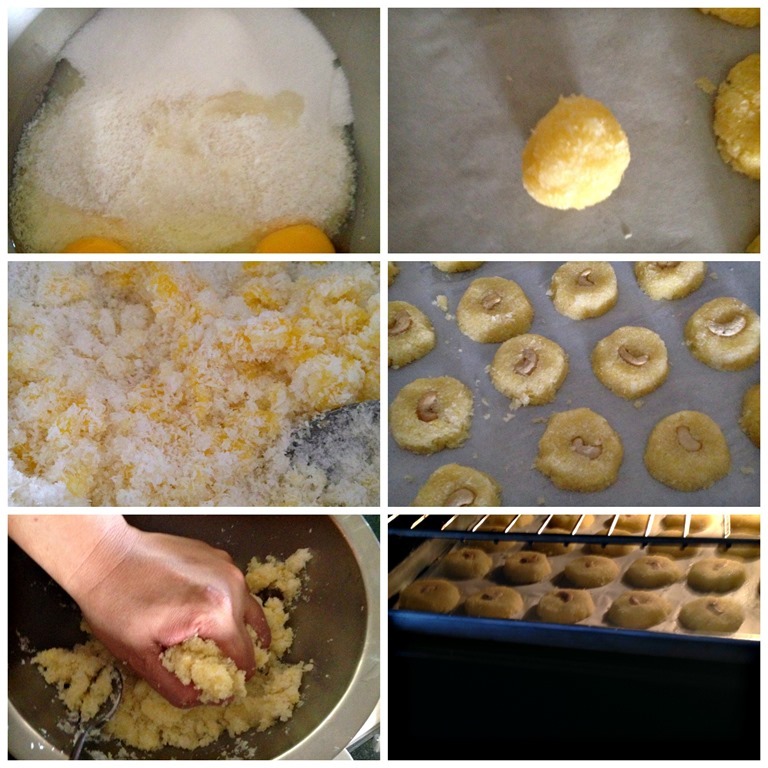 Bake in the preheated oven of 170 degree Celsius and bake for 15 minutes or until the surface is lightly golden brown. Pre-heat oven to 175 degree Celsius and lightly greased a baking tray. 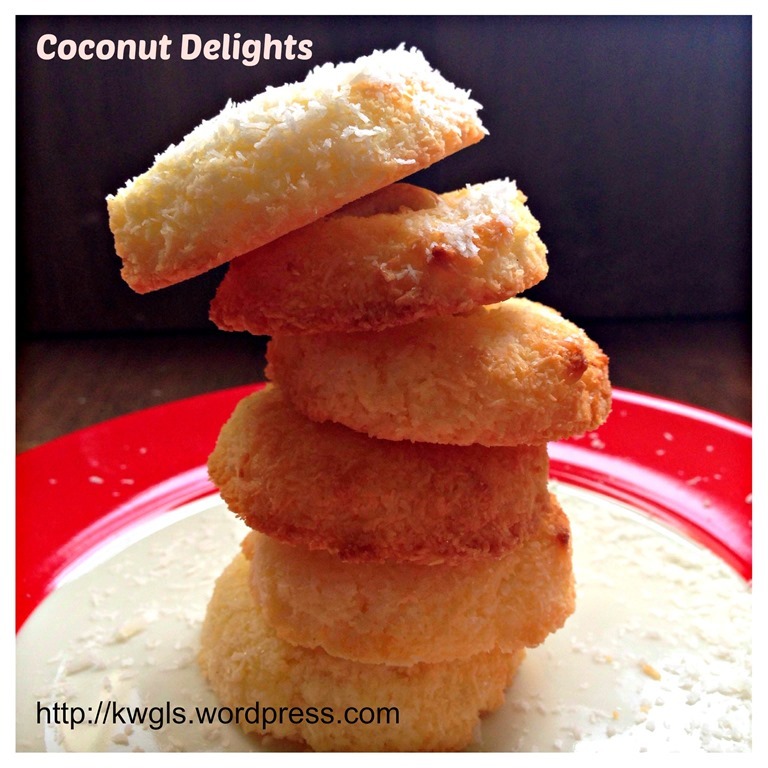 Mix all ingredients (fresh shredded coconut, eggs, sugar and vanilla essence/lemon zest) together. Stir until well mixed. 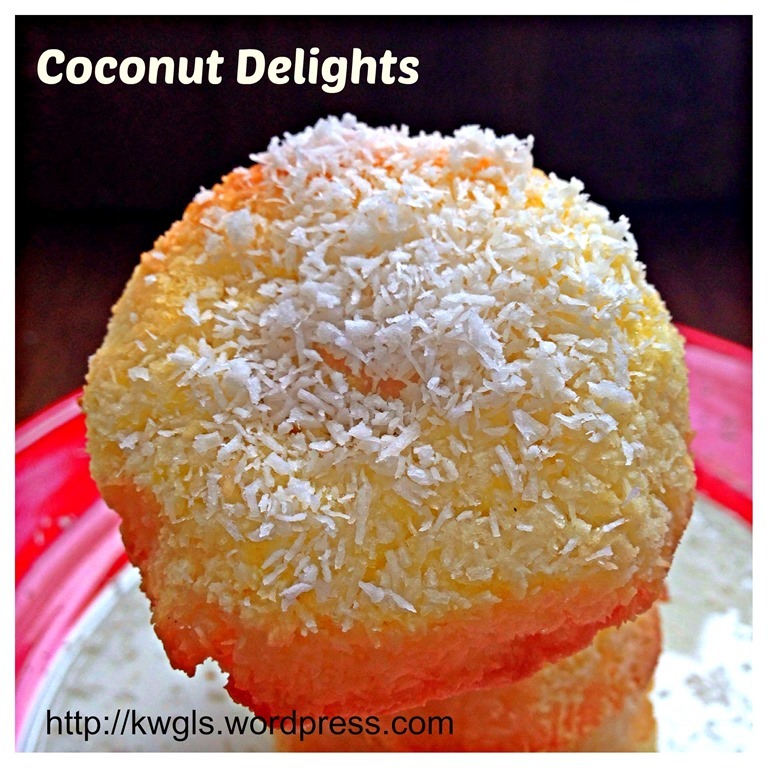 Shape the coconut into a small balls and put it in the baking sheet.Place on baking tray with about 1 finger apart. lightly press it and put on top your desired nuts. Bake in the preheated oven of 170 degree Celsius and bake for 15 minutes or until the surface is lightly golden brown. 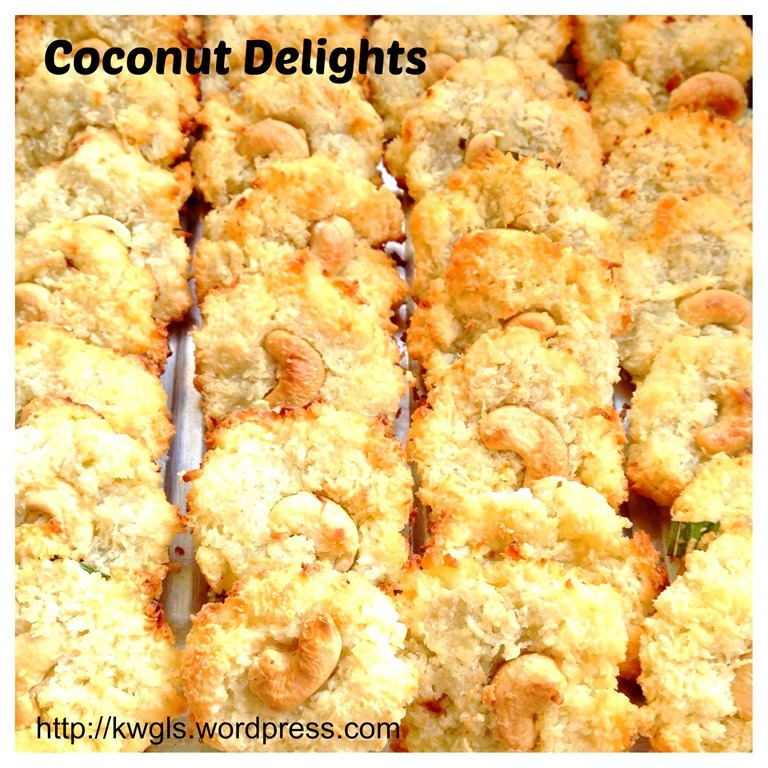 It is true that the snack is very fragrant full of coconut aromas. 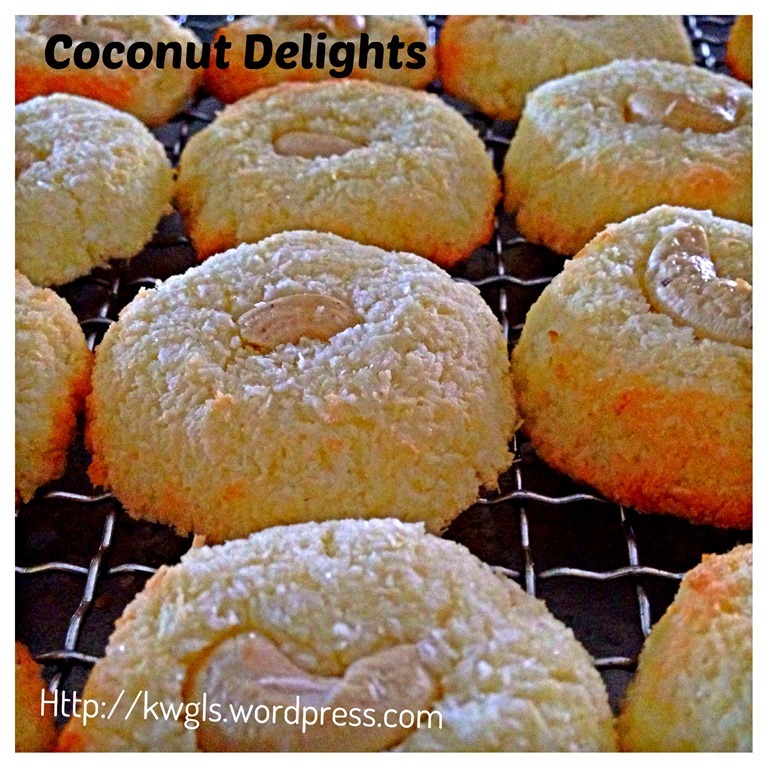 It is a rather addictive cookie and one is definitely not enough. 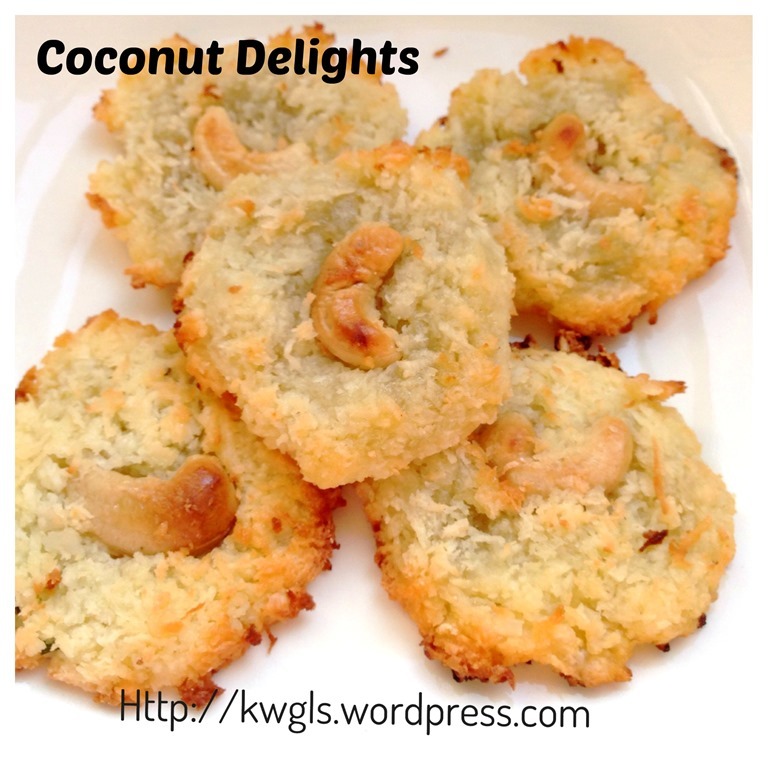 I have to thank my Facebook friend, Ms.
Lianlian Loh Gliptis for her willingness to share recipes with reader and I concur with her that it is a good party snack to be served at party or small house gatherings. 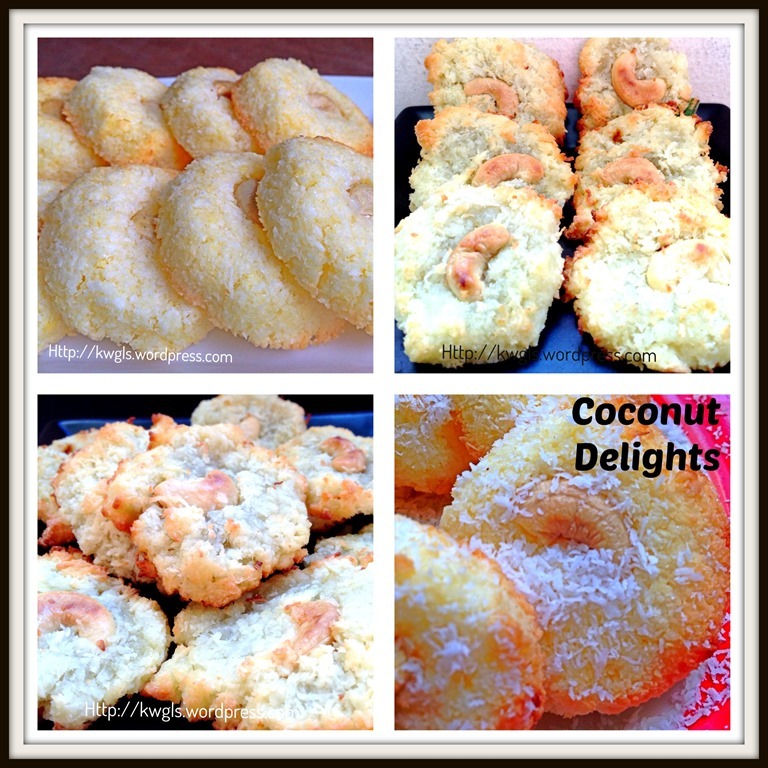 This entry was posted in Cakes and cookies, Chinese and Asian Cakes and Snacks, Chinese New Year 2014, Food Preparation Series and tagged 8, Coconut Delights, desiccated coconut cookies, GUAI SHU SHU, Guaishushu, kenneth goh, postaday, shredded coconut cookies, tropical delights. Bookmark the permalink. ← Homesick Buns? Yes, I am homesick of Sarawak Style Butter Buns..
Looks yummy! Wow it looks like ur blog has come a long way! I still remember you from google+ from way back when..good job! Stopping in from the best of the weekend party. 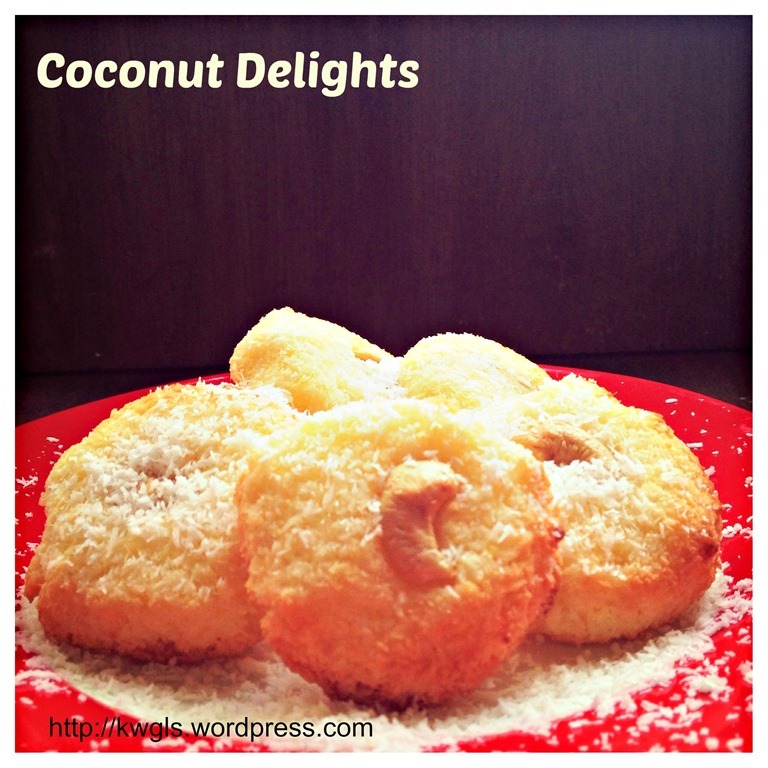 I love coconut and these look delicious! They make me wanna reach out and grab a few right out of the screen!